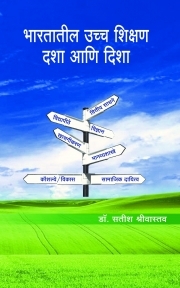 Description of "Bharatatil Uchh Shikshan: Dasha aani Disha"
The book contains articles regarding various aspects of higher education in India.India is a country of young population.Therefore, issues relating to access,quality, financial resources , private and public education, employability ,corporate responsibility and growth of higher education acquire important place in policy of higher education in India. All these concerns are discussed in this book. The author is a professor of Economics and related to higher education in various capacities since last 40 years. Reviews of "Bharatatil Uchh Shikshan: Dasha aani Disha"